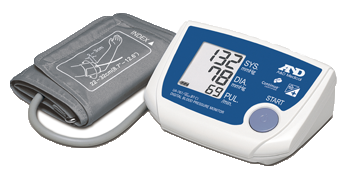 The UA-767PBT-Ci Digital Blood Pressure Monitor is based on the UA-767Plus, which has been clinically proven in accuracy. It has inherited the advanced features from the original model and is equipped with wireless transmission, giving it extended capability. With automatic cuff inflation, one-button operation, and a large display, this monitor is easy to use. The UA-767PBT-Ci is home blood pressure monitor communicates with hubs, smart phones, tablets, and Continua certified devices through Bluetooth. The UA-767PBT-Ci can send real-time communication data of blood pressure measurements to Access Points immediately. These devices can also operate in a batch-mode to send up to 200 measurements with time and date stamp through a single command.